My sister and I were recently talking about what to give as a First Communion gift. She mentioned she was going to give monogrammed notecards to her friend’s daughter. I thought that was such a great idea. Everyone should have her own personalized notecards or stationery, but especially kids and teens. With all of the technology now, it’s important for kids to still appreciate the written note. My sister’s gift inspired me to try to make my own monogrammed cards. If you’re needing a gift for graduation or just want to make these, they are really easy. You just need blank notecards, alphabet stamps and ink pads. I found that buying blank notecards in bulk is easiest. They are already scored (where it folds) and comes with envelopes. They have different colors and designs, too, which make it more fun. I liked this polka dot theme for the cards I was going to do. For the alphabet rubber stamps, it’s best if you have two sets, one with smaller letters and the other with larger letters. In the same section as the stamps, you’ll find ink pads in every color. To do a standard monogram you will need to know the initials of the person’s first, middle, and last name. Using your largest stamper, stamp the initial of the person’s last name in the middle of the card. Then using your smaller stampers, stamp the first name initial in the front and the middle name initial on the end. 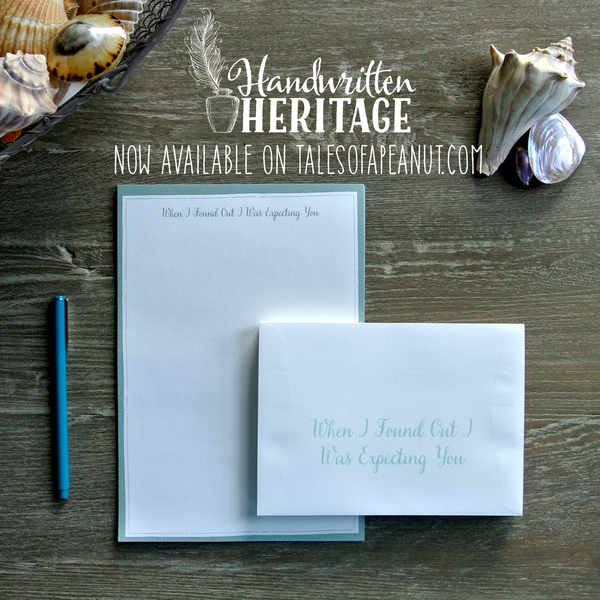 They also have stampers that say just about anything, so sometimes it is nice to give Thank You cards as a gift, as well. 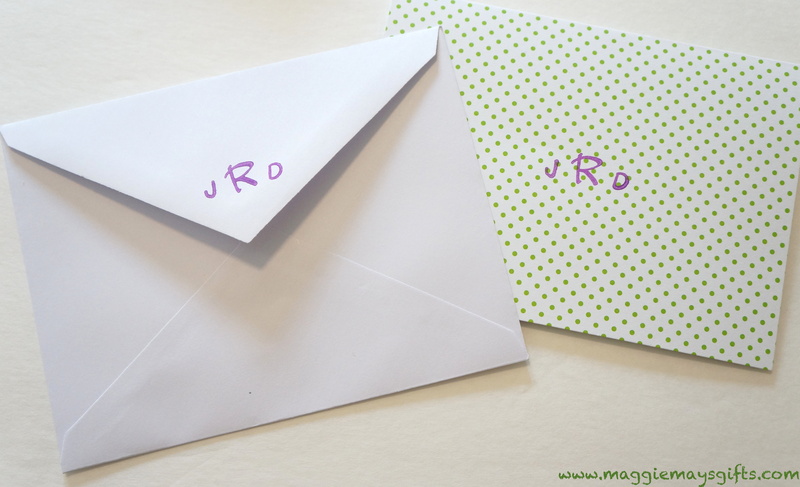 You can also monogram the envelopes for an extra touch. There are so many things you can do with these. Just don’t forget to make some for yourself while you’re at it! For a free, DIY idea or recipe to come right to you each week, follow this blog by clicking the Follow button in the sidebar. I recently saw an article about hosting a seed swap. I am not a gardener at all and don’t see myself ever hosting a seed swap but a downloadable seed packet template in the article caught my eye. I figured if I enlarged the template it would make a really cute invitation. And since I was in charge of the invitations for a friend’s upcoming baby shower, I decided to give it a shot. The template from the magazine was the size of a seed packet, so I just enlarged it to the size I wanted on a copier. I attached my enlarged template in case you want to make these. They are super easy and a lot of fun. After I cut out the template, I found some designed cardstock and traced it onto it and cut it out. Then I just folded over the flaps to create the packet. Put glue (a glue stick is best) on the areas where the flaps overlap so the packet is sealed. Leave the top flap open. For the invitation, I just typed the invite and copied it so there were four invitations per 8.5″ x 11″ sheet of cardstock. One invitation is about 1/4 of a page after you cut it out. I used decorative scissors to cut the invitations out causing a curvy edge to each side. I had to trim the invitations a couple times until they slid in and out easily. I chose to put a little cut out on the front of the packet that said, “A seedling is ready to sprout..” just to keep with the garden theme. You can put a little note on the front such as, “You’re invited” or “Please join us” or just use the packet as the envelope and stamp and address it like you would any envelope. You might find, like I did, that these are addicting. You can reduce or enlarge the template to any size you want and get really creative. Enlarge it enough to hold a flat 8.5″ x 11″ piece of paper and you’ll have yourself a very memorable resume presentation! If you like free, fun DIY ideas, click the Follow button now!